They say the more you can't have something the more you want it. Visas to stay in a country, that item that was sold out in your size, that guy/girl who takes their sweet time to text you back. For me in Paris, it's authentic home cooked Asian food. Don't get me wrong, I love love love having delicious French food at my fingertips. I'm very lucky that John is a fantastic cook and that he takes pride in his repertoire of classic French dishes. But every now and then, I just miss the amazing variety of different cuisines we have access to in Australia. I miss "contemporary modern Australian cuisine" (whatever that really is) and, I miss the hearty soul-filling comforting Asian food from my childhood (and, I suppose all the reassuring warm fuzzy connotations and feelings it evokes). It's like every now and then my feelings of homesickness manifest through my taste buds. They suddenly crave to be psychologically teleported back to that simple, happy safe place. Predictably, the re-enactment of this simple, happy safe place isn't very convincing when it's you doing the recreating for yourself, on the other side of the world. I go out of my way to try and recreate those familiar mouth watering dishes over here. I make traditional Chinese dumplings, spring rolls and Vietnamese bánh cuốn (a type of hot rice roll with meat filling) all from scratch. I can recreate modern Australian okay, but it's the traditional Asian dishes that I can't seem to get right. One of these dishes I won't even bother trying to recreate is phở, the classic Vietnamese beef noodle broth. This is serious stuff, it takes days of slow cooking and the addition of various spices at exact quantities. Even a change in the material with which you wrap these spices in before letting it float and simmer will alter the taste of your phở broth. 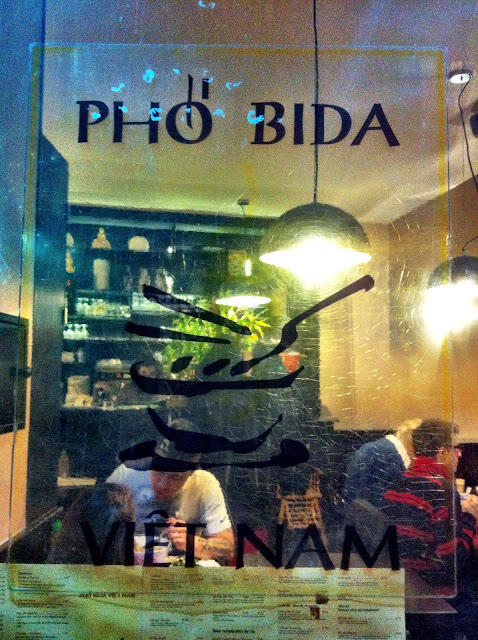 Luckily for me, Paris has always had a significant Vietnamese population. Vietnam being a French colony between 1887 and 1954 as a part of "French Indochina" resulted in the establishment of the Vietnamese community in France way before the Vietnam War. With immigration starting during the colonial period well over 100 years ago, it is really fascinating to observe how the French Vietnamese community here differs from the Australian or American Vietnamese communities. Good news for my phở cravings because I'm definitely in the right country to be having them! Take a walk in the Asian quartiers and you will be spoilt for choice with the amount of Vietnamese, Chinese, Laotian and Cambodian restaurants available. Here are my top three Vietnamese restaurants worth checking out. Of course, it's never going to get as good as my Mum and Dad's cooking obviously haha, but it hits the spot pretty well. Important note: remember that with most authentic Asian restaurants (the ones that aren't marketed towards attracting 'Western' clientele), don't expect great service, in fact I would probably go as far to say that I would feel slightly uncomfortable receiving good service. Mediocre service, a slightly dingy interior and good food is what I'm after. Also be prepared to feel a little thirsty afterwards because of flavour enhancers. I'm going to be honest, it's hard to avoid them when eating out. The only way to really avoid flavour enhancers is if someone's Mum/Dad/Grandma is cooking for you! 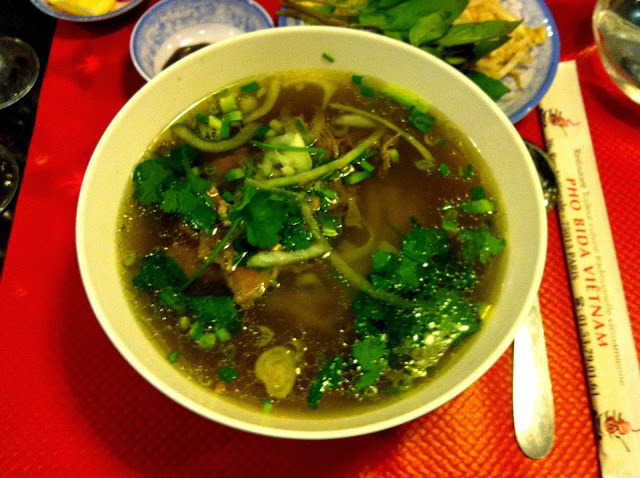 Hands down the most famous phở joint in Paris. You won't miss it, there is always a queue outside even if it is raining. If you're on your own or in pairs, you are likely to get in faster as they'll squeeze you in next to someone else. Be prepared to get to know your fellow diner really well. 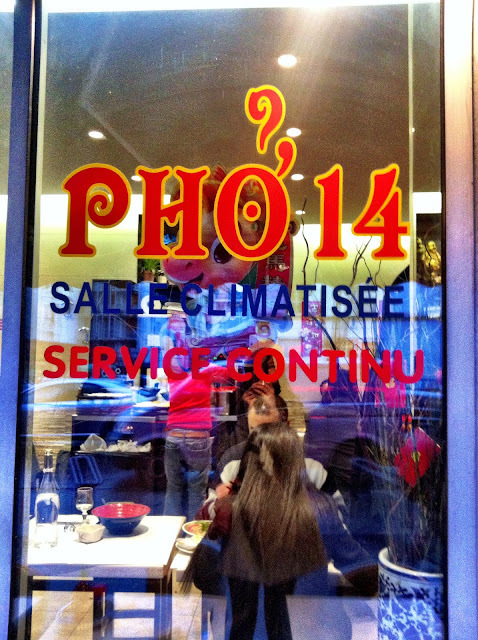 The menu is not extensive because well it is called 'Phở 14' after all. It has a good broth, balanced flavours, a teeny little bit salty for me because I have a sensitive palate but it's still worth commending. Lightly garnished, but it was good seeing that long herb with the razor like edges offered along with your standard basil, bean sprouts and lemon. Prices range from 8.10€ to 9.50€ (from the small normal phở to the large special phở with the lot). This place I have visited twice. The first time was a complete let down when I had come on a quiet random night. I suppose.. when you consider the limited batch of phở broth available for any given day/days, the best time to visit is not at the beginning (flavours still infusing) and not at the end (leftovers), but in the middle, or on a busy time slot when you know they are using fresh broth. The second time around on a recommendation to give it another shot, I was very pleasantly surprised. This time I came on a full house Saturday night. 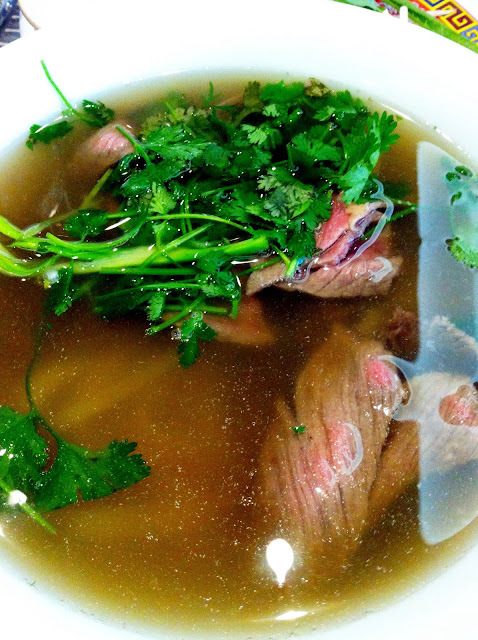 Good flavours in the broth, able to give Phở 14 a run for their money. Good garnishing, the only negative point was that the broth was a little oily for my liking. Some people prefer that, but I'm a clear broth kind of girl through and through. Menu had the classic 'let's just use liquid paper to change the prices' look ;) as well as a good range of different options. I didn't try the others because I tend not to order dishes I can make at home so I went with my standard normal phở with none of the fancy add ons. Prices here were 8€ for a small and 8.50€ for a large, too easy a choice that one, one large thank you very much..! This place is a hidden establishment in Belleville (sandwiched in between the 10th, 11th and the 19th, 20th arrondissements), the second largest Asian quartier after the 13th. The only reason I've listed it 3rd is because I was going by phở rankings rather than general rankings. 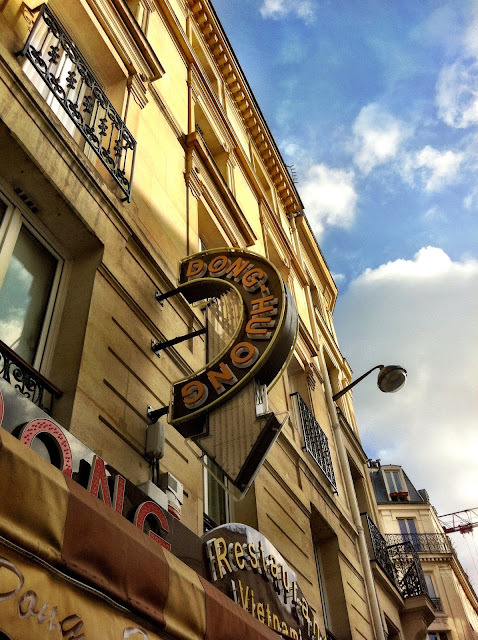 At Dong Huong, you'll enter to find a single room of about a dozen tables. Gesture to the waiters and you'll be ushered away to these hidden unexpected adjoining rooms. Not just one but many adjoining rooms! Which means you will probably get confused coming back from the bathrooms. I love this place not for the phở, it's average and not as good as Phở 14 or Phở Bida but for the other typical Vietnamese dishes available. On the weekends they have real home food specials that aren't normally available in restaurants. Points go to the extensive menu, great prices and accessibility. Plenty of room meant that it was easy to catch up with my girlfriend, her husband and their toddler here. My favourite is the bún riêu, a tomato based (thin) noodle soup with fish cakes and crab. It was so good that I don't even have a photo! Miam maim I must these at least 1 and 2. I've been going to Chez Shen in the 3rd, 39, rue du Maire Metro Arts et Metiers. I thought they were pretty good and certainment cheap (6€). Communal tables and a tad rushed service vut good enough. If you ever want a Pho partner just hollar. I'm game. When I lived in Belleville I never went sadly but this place I heard of from Cara Black so that clinched it. OH I hear you..! I've been waiting over 9 months for my visa, French administration at its finest I say. Bon courage for next week, I'll be thinking of you! Always cracks me up that the French call dumplings 'raviolis'. Kind of makes sense, I guess, but it's so strange that it's an Italian word used in a way we never would, but pluralised like in English with an s. Like buying some 'shampooing'. Wha? Happy to see Pho Bida on here! It was my favorite out of the 4 or 5 Viet restaurants I tried (Pho 14 included). I may be biased because they had my absolute favorite Viet dish: bun rieu :) But it was removed from the menu the second time I went! So, I will have to try this Dong Huong place! YES! When are you back? We will go for bun rieu at Dong Huong, it's too hard for me to recreate at home so I get my fix there, do you have any other recommendations? I'm looking for a good hu tieu nam vang, and while I'm at it, a good bun bo hue..
My sister in law makes an excellent bun rieu; I just need to take the time and watch her one day! 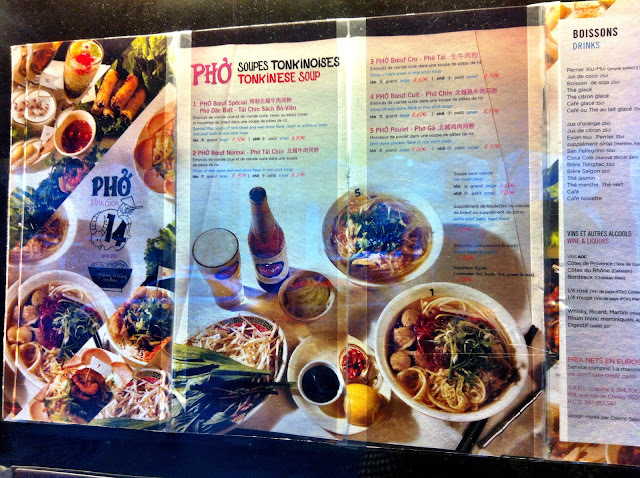 I would have rec'd Pho Bida if you didn't already have it listed. Otherwise, I truthfully didn't care that much about Pho 14, Le Bambou, or Paris Hanoi, but maybe I'm just picky and nothing compares to bun rieu, lol. Come here for those! My relatives seriously order one or the other every week. 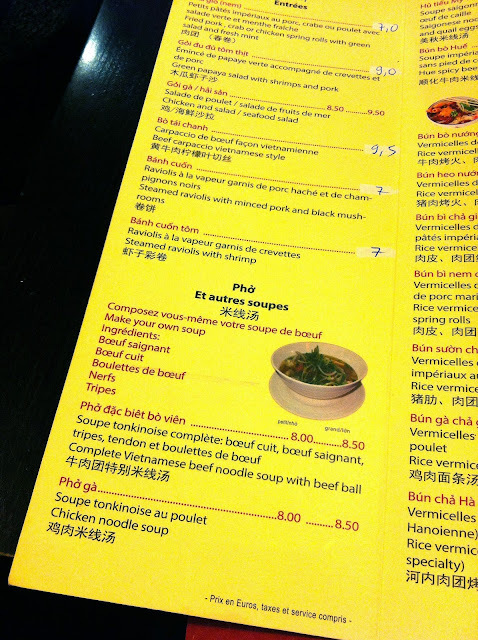 I haven't tried Le Bambou or Paris Hanoi - although it is hard to find bun rieu on the menu. I have to say I'm a hu tieu nam vang girl, I found hu tieu my tho on the weekend and I thought to myself, well that's close enough! Hurry up and come back to Paris will you! All this talk is making me hungry..